Sailing is addictive. There's something about riding the wind and the waves that makes the destination matter very little, but the journey matter a whole lot. Maybe it has something to do with the way sailing makes you slow down and breath in the world around you. Out there on the blue there's no internet, no cell phones, no bad reality television, no dramatic news headlines, no hands racing around the numbers on some clock on the wall. There's only the wind, waves and your dreams. Two of my favorite songs lament history's progression from wind driven vessels to steamships...and now more exotic power like gasoline, diesel and nuclear energy. Jimmy Buffett sings "Watched the men who rode you switch from sails to steam..." in A Pirate Looks at Forty. Michael Snell echoes Jimmy with his lyric "the steamers have whistled her days to an end..." in The Last of the Leelanau Schooners. The answer is obvious to the question of why professional mariners switched from sails to steam. Time is money and steam equals speed when compared to a square rigger in the doldrums. While money may be the answer, the "free"dom of sail helps explain part of my own infatuation with sailing. A sailor can circumnavigate the world on a very modest boat and budget. So while steamships made some men rich, others still chase priceless treasure with the wind filling their canvas and their spirits. I found your blog via Sereia. Just popping in to say hi from another sailing family. I learned how to sail on Lake Michigan not far from you, in Coloma. Beautiful summer sails on the lake inspired me to lead the life I have now, living aboard, raising a family, and cruising. Hi! I just stumbled onto your blog from a post on sailnet. 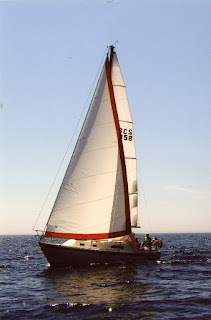 We’re also a family of four who sail an Irwin in the Great Lakes – Lake Erie primarily. Although we’re new to sailing – this is our second season – we also have a dream to someday sail full-time. I agree – sailing is addictive! Wonderful blog – looking forward to reading about your adventures!